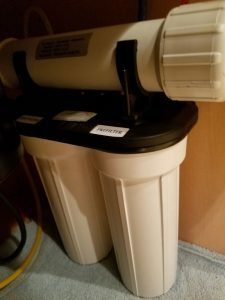 Last weekend, I mentioned to my husband that I had noticed the water was running slowly in the kitchen sink’s tap from the reverse-osmosis filter. He changed the filters and repressurized the tank. At once, the water flow was much better. As with most time-change items, the improvement was much more noticeable than the slowly degraded performance from one day to the next had been. The water from the tap looked frothy all week. Even now, it still has a few air bubbles, which naturally happens as a result of servicing the system. Not a problem—it just takes a while for the air bubbles to work themselves out. That’s true with many kinds of maintenance; it takes a little time for things to settle afterward. It’s not all that different from what goes on in our personal lives when we have to deal with changes in society and technology. However much of an improvement something may be, it’s unavoidable that there will be some amount of disruption. Getting anxious when things look different is a natural reaction. But rather than letting our worries build up, we might do better simply to recognize that small disruptions happen and that, often, they’re no more of a problem than if they had been just a few air bubbles.